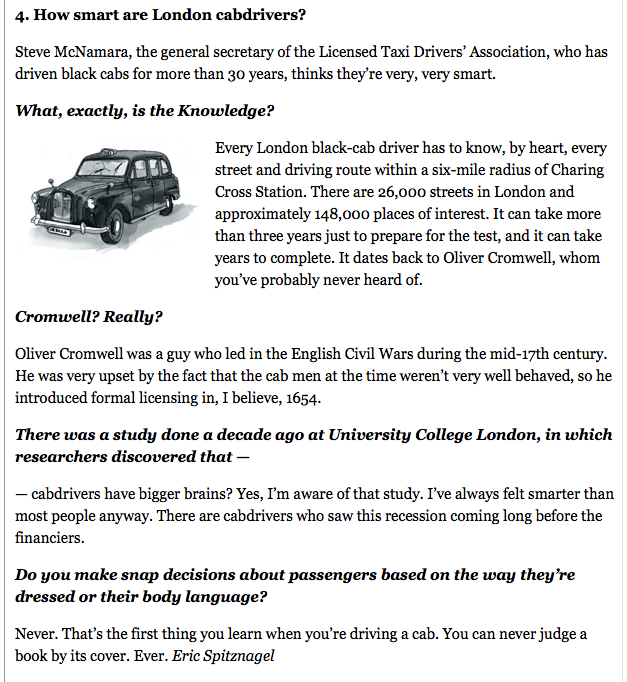 How smart are London cabdrivers? Next post: Ad Astra, Sally Ride. From “Explaining Londoners,” New York Times Magazine, March 1, 2012. To read the full story, including what Londoners think of hosting the Olympics, click here. The first taxi driver we had when we visited London told us all about the requirements for drivers, and the knowledge they have to have is awesome. He made the trip from Gatwick to our B&B an absolute delight with all his knowledge and information. Almost better than the bus tour we took the next day.